I’ve seen a few people post (or re-share) a picture of a new warning label at McDonald’s in California. Actually, I think the label has been around since 2011, although it’s hard to track back to where. That’s not the point. The point is what is this warning? What does it mean? And how should we respond? So, what does this warning say? In summary, we’re warning you there’s a carcinogen in our food. We didn’t put it there as any type of addictive. It’s naturally forming when you cook potatoes. It also exists in lower levels in other foods like breads and coffee. What the heck does this mean? 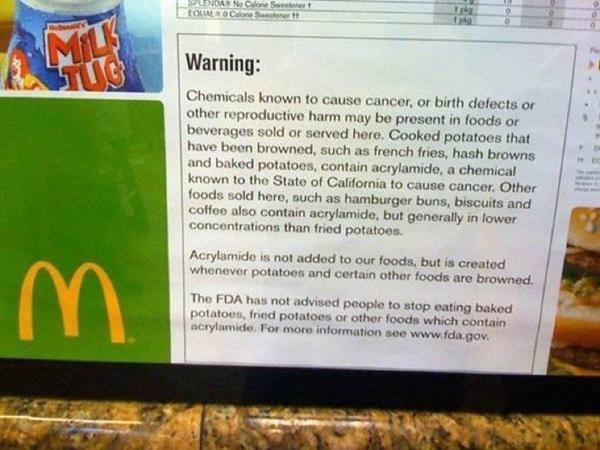 Is it the WAY McDonald’s cooks the foods that causes it? Is it some lab-created oil they cook the food in? The way they freeze or unfreeze their foods? Is it the way they keep the prepared foods warm? Nope. This also happens in everyone’s kitchens. No matter how you cook potatoes and other starchy foods, this carcinogen, acrylamide, is created. And at some level of exposure, it is believed to cancer (as well as “developmental disorders in men”). Wait. Why the heck is McDonald’s posting this then? Are they a part of the American Cancer Society or something? No. 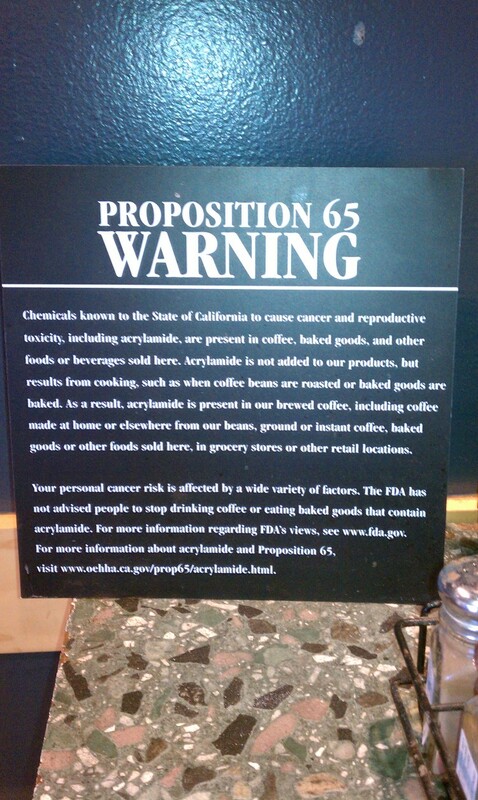 Proposition 65 in California (here’s a link to a “plain language” explanation – why don’t they just write it in PLAIN LANGUAGE to begin with??) requires anyone who is doing anything to create the chemicals that are believed cause cancer or developmental disorders to disclose, even if they aren’t doing anything out of the ordinary to create the chemical. For example, they’re not adding it to the food (or water). They’re not using a special oil to create the chemical. No matter how they’d make fries, this would happen. Is McDonald’s the only restaurant required to do this? No, but as with most things, McDonald’s is vilified and the poster child for these types of media frenzies. Starbucks also has a similar warning. OK, so Proposition 65 was written just for this chemical, right? Wrong. There are TWENTY-TWO pages of chemicals listed as cancer or developmental-disorder causing. Some are things I’ve heard of, like DDT. I remember back when I was in grade school there was a big drama with some red dye. I was thinking it was red dye 40, but might be wrong. Anyway, there were a few red dyes listed, but no link to explanation of what those dyes were/are in. Many things listed are drugs that I would assume have been discontinued. I saw a drug that used to be used to treat urinary tract infections. Many were listed as to not be taken during pregnancy. Others were things used in pesticides and other things we would probably ALREADY categorize as chemicals. This proposition has been around since the late 80s. Alright, so what should I take from this? If you want to take away that starchy foods cooked until brown (or beyond brown, read: burnt) may cause cancer, you can do that. My problem with studies like this is often times things that were “proven” are later refuted. Remember the 90s and the fat free fiasco? Yeah, none of us are healthier because of fat free cookies or margarine. And they’ve since proven these things are worse than the original “real” fats, like butter. In fact, there are chemicals previously listed that have been “delisted.” And, back in 2006, California temporarily withdrew their acrylamide claims. So, how long will this warning even last before it’s debunked? Wait, so this list isn’t even conclusive? As conclusive as science can get. It’s hard to prove cause and effect. Smoking doesn’t even CAUSE cancer. If it did, every single person who smoked would get cancer. Smoking plus something else causes cancer. Maybe a gene. Maybe another chemical. Yet, it’s widely accepted that smoking causes cancer. Anything science “proves” today can be refuted tomorrow. The FDA (and whoever else makes these decisions) probably errs on the side of caution as soon as something is starting to lean a certain direction. Why would they be so antsy to say something is dangerous, if it might not be after more tests? Well, the answer to that question is many, many layers of crap. A layer of sludge under that crap. Then slime. THEN the reason. I’m not sure I can sift through that mess and give a REAL answer, but I’ll try. First, you have research schools who are trying desperately to get funding. They want to put out research findings quickly, that are relevant and useful, and can make a difference. Many studies are done on lab animals, such as rats. While many people have a problem with this, I don’t. At least from a “rats are animals” perspective. Rats are disgusting, people! But I do have a problem with comparing rats to humans on a 1:1 ratio. There are many differences. And the way we ingest these chemicals is different than the way the rats do. We lead different lifestyles. And ingest varying amounts over varying times. Plus, to be listed, 1 in 100,000 rats has to develop cancer over a 70 year period. SEVENTY YEARS! It’s not even considered early onset by the time someone’s 70! And these are raised levels. Consistently over that time. And it only has to be one. Out of one hundred THOUSAND! That’s a very small percent. Now, does anyone want to unnecessarily take the risk? Probably not. But then you add in the politicians who want to get elected, blowing something like this out of proportion to build a platform. I mean, come on. Posting this in every restaurant, when you can do the same thing at home? Isn’t there a better way to communicate this? Why vilify the restaurants? Sure, it’s almost always healthier to eat at home. But this is not something the restaurant is doing, other than cooking the food you want, and would probably have at home anyway. So, how did this become such a drama? The media, friends. Just like research schools have something to gain by using these studies. Or politicians by creating a platform. Media gets ratings and stories and whatever else you get from this. You’re reading this, aren’t you? Alright, so what do I need to take away? For this chemical specifically, they say it’s from baking, frying or broiling starchy foods. Specifically mentioning potatoes, breads and baked goods. And there’s also reference to coffee beans. They say boil or steam potatoes. And don’t toast bread at all, or toast it as lightly as you can. I personally like burnt toast with peanut butter. Sooo…. All things in moderation, I say! Finally, we all know most baked goods aren’t great for us anyway. If you under-cook, you risk salmonella from the eggs, right? You’re damned if you do, you’re damned if you don’t. And either way, you’re probably taking in a bunch of sugar (or fake sugar), flour and butter (or margarine if you still eat it or oil, which also isn’t supposed to be over-cooked). So, stop eating? Yes. Just kidding. Eat all things in moderation. Don’t eat fries and donuts for every single meal. Eat a varied, moderate, reasonable diet. And maybe occasionally DON’T supersize? Or you know, go ahead. After all, everyday you live you’re one day closer to death. Just kidding. I love ending on a bright note.